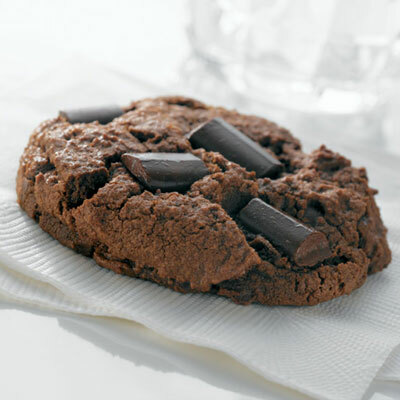 Every bite in these Jumbo Chocolate Cookies is completely delicious. MELT 2/3 cup chunks in microwave-safe bowl on HIGH power (100%) for 45 seconds; STIR. Chunks may retain some of their original shape. Microwave at additional 10- to 15-second intervals, stirring just until smooth. SIFT flour, cocoa, baking soda and salt into medium bowl. Beat butter, brown sugar and granulated sugar in large mixer bowl until creamy. Add melted chocolate and mix well. Add egg and vanilla extract, mixing until well blended, about 1 minute. Add flour mixture, mixing just until blended. Stir in remaining chunks. Drop dough by level 1/4-cup measure 3 inches apart onto prepared baking sheets. BAKE 16 to 18 minutes or until wooden pick inserted in center comes out with moist crumbs and the tops have a cracked appearance. Cool on baking sheets for 5 minutes. Remove to wire rack to cool completely.